This site will be a container for all my musings about the analytical pipeline. The overall goal of an analytical pipeline is to answer an analytical question. To achieve this overall goal, different data sources have to be targeted and their data has to be ingested into the pipeline and properly processed. During these first steps the data ingested into the pipeline often has to be stored in one or more different data stores, each is used or its special type of usage, finally the result of the data processing has to be delivered to its users, its audience. Depending on the nature of the question, different types of processing methods and also different data stores may be used along the flow of the data throughout the pipeline. Successfully ingested data often gets processed more than once to answer different questions, and during its existence (inside an analytical data platform) this data will be transformed into various shapes, wrangled by different algorithms, and ingested into different "data stores". For this reason I believe that these activities are tightly related, and the above mentioned sequence of these activities will just aid as a guidance. I will use blog posts to describe how different activities are combined to answer analytical questions. In most of my upcoming blog posts I will link to different topics from the activities used in the pipeline. Each activity has its own menu and is by itself representing an essential part in analytical pipeline. Hopefully this site will help its readers as much as it helps me to focus on each activity always knowing that most of the time more than one activity has to be mastered to find an answer to an analytical question. From a data visualization point of view I'm more excited about the 2nd option, than about the addition of Python to the toolstack. What I love about the usage of svg next to the other options for data visualization is the simplicity with wich svg charts can be used. They do not extensive knowledge of a programming language like JS, R or Python (I'm pretty sure, that some consider the composing of svg charts also as some kind of programming :-) ). Another great advantage is that they just can be used inside the Power BI table and matrix visual, without any dependencies to other programming environments. 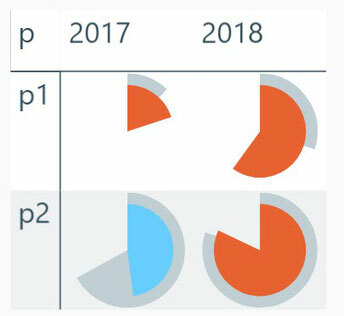 I have to admit that I'm quite excited about the possibility to use svg charts from inside the table and matrix visual. This easily allows to create microcharts and small multiples. In this post (it's more than likely that this will not be my last one) I use 2 percentage values to create layered segments of a pie. This kind of visualization is called "Harvey Ball".